One of the greatest things about having South Beach Star published is reconnecting with old friends. The book is really a tribute to a special time in South Beach when I met so wonderful people. While many of those friends have either left the Beach, passed on or have disappeared from my life, the book has reunited me with many great friends that I have not spoken with in years. Old friends are coming out of the woodwork from all over the country to support me and the book. It gives me pleasure when someone reads the book and recognizes themselves or a special time in their life. South Beach Star is set in the mid-nineties when the South Beach nightlife scene was vibrant and it was a time when South Beach felt like a community. Please take a look in the front of the book and you'll note that the book is dedicated to Gilbert Stafford, a legendary spirit and legendary door god who has since passed, and to anyone who had to pleasure to pass through his velvet ropes. 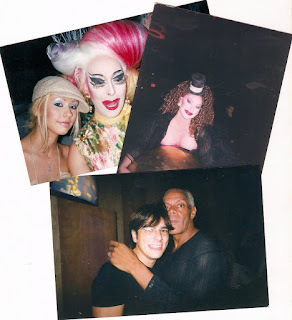 Photo: A very young Christina Aguilera and Adora at Liquid, the beautiful Paloma, and Herb Sosa with Gilbert Stafford.